Devising a method for zipper organization and storage can save time and reduce frustration when your handmade business involves sewing! When I first started making cash envelope wallets, I only bought the basics in zippers–black, white, cream, and navy. But I soon realized how much fun my customers (and I!) were missing out on and began to add more colors. I kept them in a long, shallow, wooden drawer, and finding what I needed was kind of a pain. But even worse was keeping track of what I had on hand and reordering in a timely manner. As my business grew and I was ordering hundreds of zippers at a time, I knew I needed a better solution. To keep the zippers bundled, they are strung through the bottom tape extension (the area below where the teeth end) onto large safety pins. We’ve found about 15 per pin to be ideal. I say “we” because I recruit either my husband or oldest son to do this job! One great thing is that if a zipper color I need is in back of another, I don’t have to remove the one in front. The safety pins are large enough that I can unfasten them and remove zippers right where they hang. Chances are that you’ll never have access to this type of carousel, but you can make your own wall version with a piece of wood, screw-in hooks, tags, and safety pins. 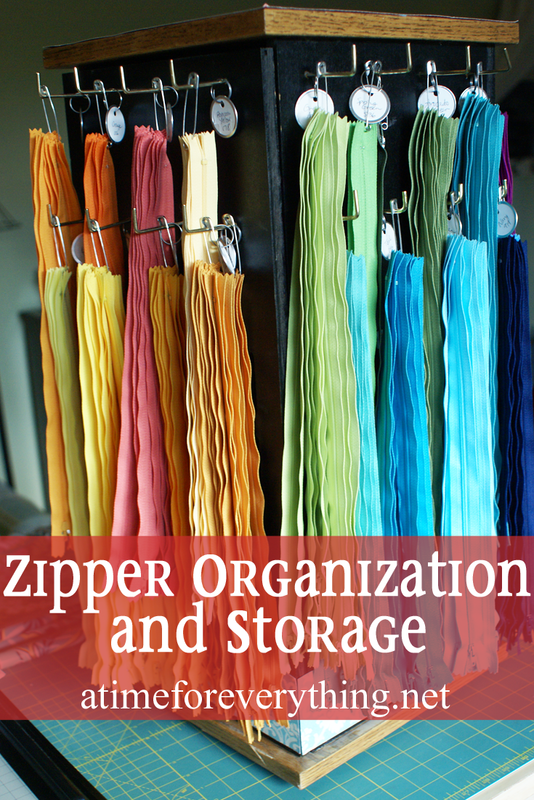 If this inspires you to create a similar system for zipper organization, I’d love for you to come back and leave a comment with a link to a picture. Happy organizing!